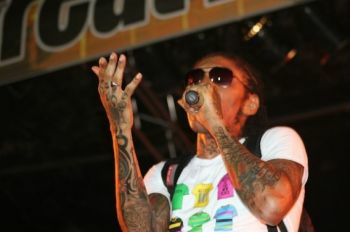 Dancehall star Vybz Kartel was sentenced to life imprisonment by a Jamaican court on Thursday. Kartel and his three co-defendants all received a life sentence. Kartel was sentenced following a murder conviction last month by a 10-1 verdict. It will be 35 years before Kartel is eligible for parole. Kartel, whose real name is Adidja Palmer, was a controversial figure in Jamaica whose drawn-out trial divided much of the country. He was convicted for his role in the deadly beating of Clive “Lizard” Williams at Kartel’s home in Jamaica in 2011, along with three other defendants. He was involved in another murder trial in 2013, although he was found not guilty in the murder of Barrington Burton, a businessman in Jamaica. LMAO!!!! ONE DOWN MANY MORE TO GO!!!! no more daggering and I guess online his hands or another dude will know his....long like is knife!!!! !